William, center, smiles at the camera. WILLIAM is a member of our Trans Justice working group and has been involved with APIENC for over six months now, helping form trans&gnc specific spaces. William was actively involved in organizing our first ever Trans&GNC Rights and Empowerment Day, where he presented his very first workshops ever (! ), helped organize the clothing swap, and supported a lot of event outreach. 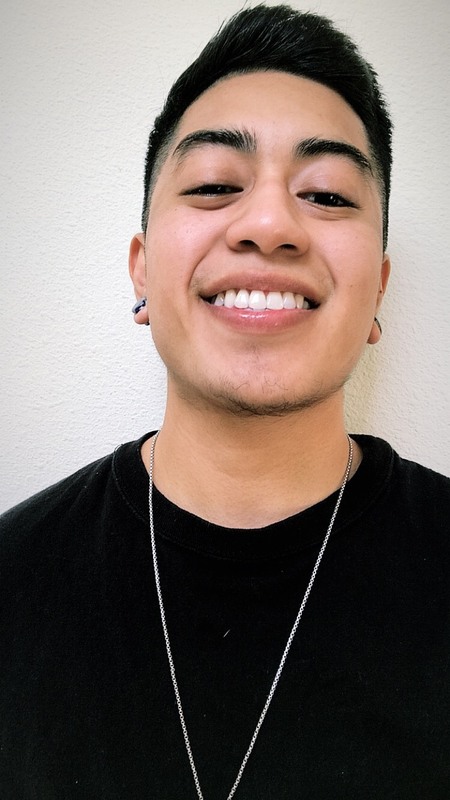 William identifies as a first generation queer trans Filipinx Peruvian person of color and currently works part-time as a Library Assistant at the San Francisco Public Library. He is attending San Jose State University’s Masters in Library and Information Science. If that wasn’t impressive enough, William also manages a grassroots organization, Across Gender, of which he is the founder and director. William’s passion is outreaching to marginalized folx within the trans and gender variant communities. He started out by opening up about his identities on social media, in the hopes that his story would reach others in similar situations. One pivotal memory William shared was when he reached out to a few trans folx of color to share an intimate meet-up to exchange stories and experiences. At the end of this meet-up, a young person pulled William aside and thanked him: “As a person who has been medically transitioning for 2 years and knowing I’ve been trans since the age of 4, this is the first time in my life I have ever felt like I belonged.” Out of the life experiences that have impacted William’s life and work, this one experience really stood out. “When I understood my identity as a biracial, first generation, queer, trans person of color I asked myself, ‘Where do I fit?’ and ‘Where do I belong?’. In life, especially while socially and medically transitioning, I never really felt I belonged in certain spaces, like puzzle pieces that didn’t quite fit,” says William. William soon realized how lonely transitioning as a person of color can be and the toll it can take mentally and emotionally. When he reached out to trans people of color, especially youth, they often talked about this unique feeling of loneliness, hollowness, and emotional pain. Across Gender came to fruition because William wanted to create a space in which people can look into other people’s experiences, stories, and faces to validate and inform their own exploration of their identity, without forgetting their own experiences of themselves in the world. When asked why he volunteers with APIENC, William shared, “That’s simple, the people . . . MLin and Sammie are, hands down, the most hardworking and genuine people I have ever had the pleasure of working with.” William also volunteers with Gender Spectrum where he works with trans and gender variant youth to provide a safe space for them to connect with others, share their experience, and feel the comfort of a supportive community. Fun Fact! William is starting a YouTube series exploring all the haunted places in the San Francisco Bay Area!